SLATWALL WITH LOW PRESSURE LAMINATE - LPL, VENEER, FAUX FINISHES, RAW, HIGH PRESSURE LAMINATE - HPL, AND OTHER SPECIALTY FINISHES ARE ALL AVAILABLE THRU BINKOWSKY-DOUGHERTY. THE BASE COATS, PRECISION AND PRINT COATS AND MELAMINE TOP COATS ARE APPLIED TO THE MOST SELECT SUBSTRATE SLATWALL WITH HIGH PRESURRE LAMINATE MAY BE CUSTOM ORDERED WITH LEAD TIME AND MINIMUM FROM ANY OF THE LEADING HPL MANUFACTURERS COLOR PALETTES. SLATS ARE STANDARD RUNNING 8' DIRECTION. 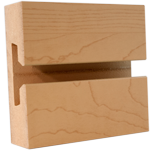 SPECIAL ORDER REQUESTS FOR SLATS RUNNING 4' WAY WILL BE SUBJECT TO A LEAD TIME. LEAD. PLEASE NOTE LEAD TIMES MAY VARY BASED ON MANUFACTURERS PRODUCTION SCHEDULE AT THE TIME OF ORDER.